“This past year has been the most difficult and painful year of my career,” Musk told the Times during an emotional phone conversation on Thursday. He said his own health has been taking a hit after putting in work weeks that often have stretched to as much as 120 hours. “This has really come at the expense of seeing my kids. And seeing friends,” he said. Musk’s interview adds to what has become one of the stranger corporate sagas in recent years. In the past few months, he has recently feuded with journalists, Wall Street analysts and one of the people involved in the rescue of a Thai youth soccer team. Last week, Musk tweeted that he had plans — and funding — to take Tesla private. 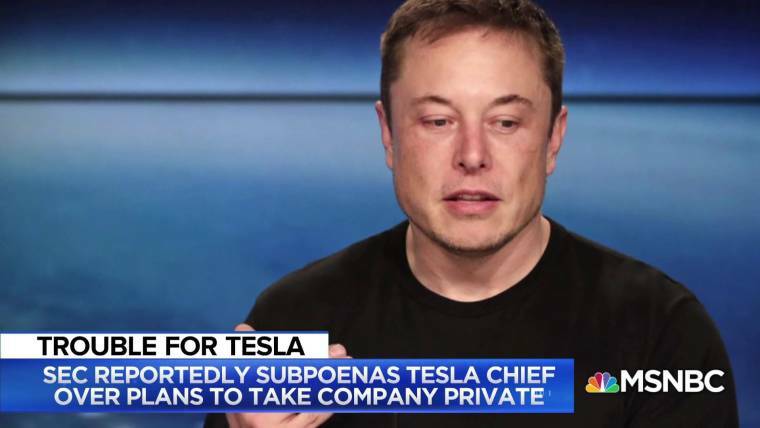 Musk has since said he’s working on finding funding, and the Securities and Exchange Commission has reportedly issued a subpoena to Tesla over the situation. The situation was further complicated when musician Azealia Banks posted on Instagram that she had been with Musk at his house when he tweeted and implied that Musk had been on acid, which Musk has denied. The controversy surrounding Musk has weighed on the company’s stock price, which had shot up after Musk’s initial announcement. Tesla shares were down more than 8 percent in early afternoon trading on Friday. Much of the pressure from the last year has centered around the Model 3, the company’s first mainstream model and the foundation of its plan to become perhaps the most profitable automotive company ever. But when production launched in July 2017 virtually everything that could go wrong did. Only now are things coming together. In June, Tesla announced meeting a critical milestone — producing 5,000 sedans in one week. Perhaps more importantly, analysts are suggesting that wasn’t a fluke. “Tesla seems well on the way to achieving a steady weekly production rate of 5,000 to 6,000 units per week,” wrote George Galliers, Evercore’s lead automotive analyst. One phrase in particular is coming back to haunt Musk: the assertion that he had “funding secured.” He tried to clarify this, but the fact remains that there is no firm plan yet in place, just an apparent solid interest in backing privatization by officials with the Saudi Arabian sovereign investment fund. Musk is a dedicated fan of social media and initially told the Times he has no intent of backing down on his frequent tweeting, but a spokesman subsequently advised the paper the 47-year-old exec won’t discuss the proposed buyout again without first discussing it with the Tesla board. The damage may already have been done, however. If the SEC determines Musk acted improperly, he and Tesla could face major fines — or worse. Several lawsuits have already been filed by short-sellers who contend the tweets were really meant to hurt them financially. But the SEC and the short-sellers aren’t the only ones who could make things even more excruciating for Tesla in the months to come. The company appears locked into a war of words — and a court battle — with a former employee at its Gigafactory battery plant. It has accused Martin Tripp of sabotage but, in turn, Tripp has positioned himself as a whistleblower, filing both his own federal court suit and allegations with the SEC of quality and safety issues. This week, Tripp put out his own tweet storm with pictures he claimed showed defective batteries installed on Model 3s shipped to customers. At least two other self-styled whistleblowers have surfaced: Former Tesla security team member Karl Hansen this week accused Tesla of wiretapping and hacking the computers and phones of current and former employees, as well as some of its competitors. There are other headaches. Tesla faces a series of other possible legal woes, including a case before the National Labor Relations Board looking into the mass firing of Fremont workers in 2016 that, Tesla critics contend, was motivated by their support for a union drive. Even before the privatization tweet stirred things up, Musk had a premonition that appears likely to prove accurate. On the other hand, some things could be poised to get significantly better. Tesla appears to finally be working through what Musk has described as “production hell” at its Fremont, California, assembly plant. His rocket company, SpaceX, is literally flying high and preparing to help the U.S. resume manned launches from American soil; and even Musk’s tunneling venture, the Boring Company, is lining up some potentially lucrative contracts.